Don't really know what to say about this snus. I like it! The smell is very strong like with most Offroad snus. It takes my mind to some kind of cola candy. Definitely not like coke or pepsi. The taste is not that strong and you can really just hint the cola taste. There is some kind of spice that I can not really put my finger on. Think it could be cardamon. After a while you can feel a little bitterness, imo that bitterness comes with all the V2 snus and I'm starting to like it. I just think the taste of Cola could be a little stronger. Like with the other Offroad snus I wish the taste and smell was a little more balanced. Don't like the material of the pouches. They taste a bit like paper and kind of takes over the cola taste after a while. Imo white portions should look like the catch white portions do. These Offroad pouches are a little brown. Don't know if that is because it has more moisture to it than the catch portion does? 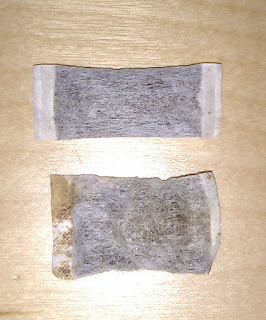 Here you can se the difference between a catch pure mint and an offroad white coola portion. Conclusion: Offroad Coola is overall a good snus with a wonderful smell and good taste. It would definitely be one of my favorites if the pouch was more discreet but still had the same level of nicotine. 1 comment on "Offroad Coola"
Just found your blog, and it's really something extra. Like how you describe this snus though I'm not sure I'd like the texture on the bags. What do you think of putting the snus in the oven on low temp to make it a bit less moist?